A one server based network. In Computer science, client-server is a software architecture model consisting of two parts, client systems and server systems, both communicating over a computer network or on the same computer. A client-server application is a distributed system made up of both client and server software. Client server application provide a better way to share the workload.The client process always initiates a connection to the server, while the server process always waits for requests from any client. When both the client process and server process are running on the same computer, this is called a single seat setup. Another type of related software architecture is known as peer-to-peer, because each host or application instance can simultaneously act as both a client and a server (unlike centralized servers of the client-server model) and because each has equivalent responsibilities and status. 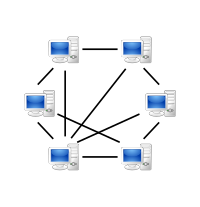 Peer-to-peer architectures are often abbreviated using the acronym P2P. The client-server relationship describes the relation between the client and how it makes a service request to the server, and how the server can accept these requests, process them, and return the requested information to the client. The interaction between client and server is often described using sequence diagrams. Sequence diagrams are standardized in the Unified Modeling Language. Both client-server and P2P architectures are in wide usage today. The basic type of client-server software architecture employs only two types of hosts: clients and servers. This type of architecture is sometimes referred to as two-tier. The two-tier architecture means that the client acts as one tier and server process acts as the other tier. The client-server software architecture has become one of the basic models of network computing. Many types of applications have been written using the client-server model. Standard networked functions such as E-mail exchange, web access and database access, are based on the client-server model. For example, a web browser is a client program at the user computer that may access information at any web server in the world. Always initiates requests to servers. Usually connects to a small number of servers at one time. Usually interacts directly with end-users using any user interface such as graphical user interface. Always wait for a request from one of the clients. Serves clients' requests then replies to the clients with the requested data. A server may communicate with other servers in order to serve a client request. If additional information is required to process a request (or security is implemented), a server may request additional data (passwords) from a client before processing a request. End users typically do not interact directly with a server, but use a client. 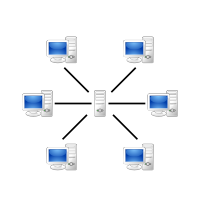 In most cases, a client-server architecture enables the worsening of roles and responsibilities of a computing system to be distributed among several independent computers that are known to each other only through a network, so one of advantages of this model is greater ease of maintenance. For example, it is possible to replace, repair, upgrade, or even relocate a server while its clients remain both unaware and unaffected by that change. This independence from change is also referred to as encapsulation. All the data is stored on the servers, which generally have better security controls than most clients. Servers can better control access and resources, to guarantee that only those clients with the appropriate permissions may access and change data. Since data storage is centralized, updates to that data are much easier to administrators than what would be possible under a P2P architecture. Under a P2P architecture, data updates may need to be distributed and applied to each "peer" in the network, which is both time-consuming and error-prone, as there can be thousands or even millions of peers. Many advanced client-server technologies are already available which were designed to ensure security, user friendly interfaces, and ease of use. It works with multiple different clients of different specifications. Networks traffic blocking is one of the problems related to the client-server model. As the number of simultaneous client requests to a given server increases, the server can become overloaded. Contrast that to a P2P network, where its bandwidth actually increases as more nodes are added, since the P2P network's overall bandwidth can be roughly computed as the sum of the bandwidths of every node in that network. Comparing client-server model to the P2P model, if one server fail, clients’ requests cannot be served but in case of P2P networks, servers are usually distributed among many nodes. Even if one or more nodes fail, for example if a node failed to download a file the remaining nodes should still have the data needed to complete the download. Specific types of clients include: web browsers, E-mail clients, and online chat clients. Specific types of servers include: web servers, FTP servers, database servers, E-mail servers, file servers, print servers. Most web services are also types of servers. This page was last changed on 20 February 2019, at 17:56.